We all want to know if the choices we make are the right ones and if we are really doing the best we can with what we have. This entertaining test can help guide you in the right direction, and give you life advice your soul desperately needs to hear. 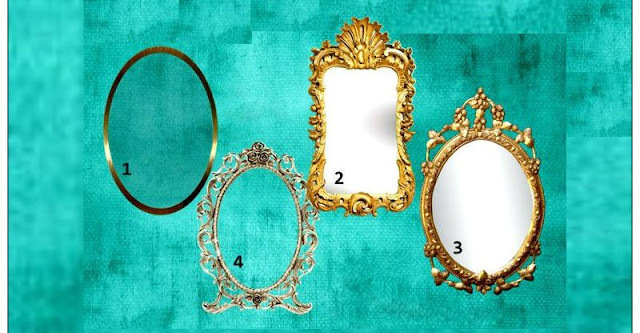 All you have to do is choose the mirror you like most from the 4 below, and read your matching description. The moment is now. Embrace your life and stop resisting your true heart’s desires. Breathe life into your day with courage and hope. Don’t muddle through, this is the only chance you’ll ever get to be really YOU. How many times have you made excuses to yourself as to why you can’t do something? And how often have you secretly hoped something ‘exciting’ will happen to shake things up? Of course, you know, deep down, that such rewards only come with effort. With participation from you. Your heart knows what you want to do. You came to Earth to dance. So dance! If you are already doing this, then amazing, your life is slowly transforming! You are as deserving of all the good things in life as anyone else. Love, attention, success, and respect. The rain falls on us all, the sun shines on us all. Isn’t it time to let go of any limiting beliefs about yourself that hold you back? Low self-esteem is really a way of saying ‘I’m frightened to discover who I really am.’ It’s a protective coat, reassuring us that we’re not really worthy, so why bother putting ourselves out there. But you see, it’s just fear. Nothing more. It can be banished. And you know you don’t want to live in fear. What an unhappy existence that would be. If you are already doing this, then amazing, your life will transform! If you have a tendency to put things off, perhaps out of fear, indecision or laziness, then consider resolving this unhelpful habit. You don’t want to put off all the good things that could happen to you. Destiny awaits, but it only waits so long. Perhaps start by committing to one task, and complete it. Soon, you’ll get into the swing of completing things and your confidence will soar. You are ready for love and have so much love to give. It is time however to release any fears or negative patterns that stop you from opening your heart. The past is the past, if you learn from it, you won’t be in danger of making the same mistakes. Every moment of every day the Universe is listening to your thoughts – even when you think you’re alone in your head – you are not. It is registering what you are thinking and manifesting a match. If you think fear, you won’t get the match you desire. So open your heart – visualize yourself safe in the arms of someone worthy of your love.